Apple has equipped the iPhone 7 with a new-generation A10 Fusion chip. 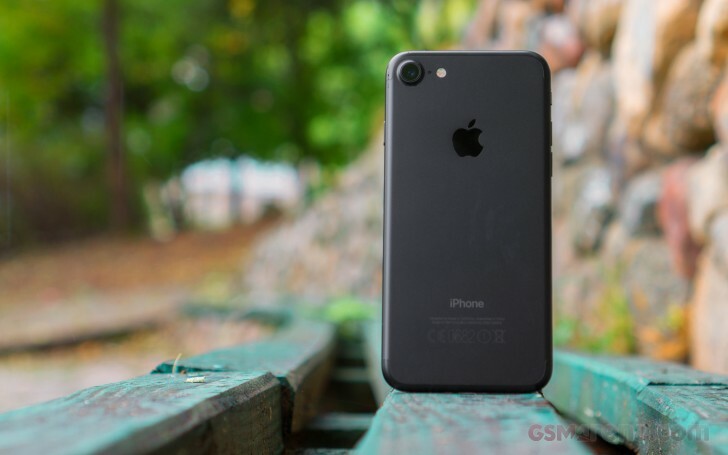 It has a quad-core CPU, a first for the iPhones, with two high-performance cores running at 2.34GHz and two power-saving ones. The high-performance ones run about 40% faster than the A9 chip and two times faster than the A8. The other two are more power-efficient cores and require only 20% of the power needed for the high-performance cores. The guys over Chipworks have been working hard to decrypt the new A10 Fusion chip and what's interesting is that they can't find the two low-power cores. In fact, those are not available to anything but the OS itself. No benchmark or game can use those; in fact, the benchmarks can't detect them at all - they show the CPU as dual-core. Chipworks are still guessing the position on the chip of those two cores, but their placement is not of importance right now, but the fact that they are exclusive to the iOS and can't be found by anything else. So, as far as the processing performance is concerned - all benchmarks use the two high-performance A10 cores ticking at 2.34GHz. And speaking of CPU cores, meet the most powerful mobile processor core in the world to date - the one inside Apple A10 Fusion. It runs on 2.34GHz, which is among the highest clocks we've seen, but it also offers the best performance right now. The new A10 core offers double the processing power of the Snapdragon 820's Kryo (OnePlus 3), double the Cortex-A72 performance (Huawei P9), and 40% increase over the CPU Twister core inside the iPhone 6s, 6s Plus, and SE. But how about two of those? Well, the dual-core A10 processor is more powerful than any other dual, quad, hexa, octa, or deca-core processor on the market. It's 40% better than the quad-core Kryo (S820, OnePlus 3) and the dual-core Twister inside the iPhone 6s generation, and just a hair on top of the latest Kirin chipset inside the Honor 8 (4x A72 + 4x A53). Chipworks hasn't yet determined the exact GPU model, but it confirmed it's indeed a six-core unit (just like the PowerVR GT7600 six-core GPU inside the iPhone 6s). We know Apple promises a 50% performance bump, so let's see. The 1080p offscreen tests which help us determine the raw performance put the A10 GPU on top of any other GPU we've tested so far. The 3.0 test gives the A10 GPU about 20% more power over the Adreno 530 in the OnePlus 3 and 30% over the latest Mali-T880MP12 inside the Exynos-powered Galaxy Note7. It is also 50% better than the PowerVR GT7600 inside the iPhone 6s, as promised. The 3.1 test gives the A10 GPU 30% more power over the Adreno 530 and 50% sharp over the Mali-T880MP12 (Note7) and PowerVR GT7600 (iPhone 6s). The iPhone 7 runs on a sub-1080p resolution, which gives it an advantage over the flagship competition running at 1080p or 1440p. The iPhone 7 reaches the 60fps refresh-rate cap on both tests, so there is nothing the phone can't handle not today, and not for the next couple of years to come. BaseMark ES 3.1 is a super-heavy GPU benchmark that only flagships can finish without crashing or taking an hour or two. The iPhone 7' GPU not only topped that one by a mile, but it also received another gold medal by BaseMark for being the best device in their database so far! Next, it's time to run the compound benchmarks, which compute CPU, GPU, RAM, storage, UX performance among others. You bet the iPhone 7 topped the BaseMark OS II 2.0 test with a huge gap between the second-best phone - the two Galaxy Note7 models. The device also received a Gold medal for being the best device in BaseMark OS II 2.0 all-time chart taking the first place! A respectable moment of awe silence goes here. Finally, AnTuTu 6 pretty much confirms the BaseMark OS 2.0 conclusions - there isn't any better smartphone than the iPhone 7 right now. Apple has done it again - it made the best mobile chipset from which others can only learn from. Its dual-core processor, even without the help of the tiny energy efficient cores, beats any other processor out there. The A10 GPU is equally impressive acing every graphic benchmark. The iPhone 7 is the fastest and most powerful smartphone in the world. It runs cooler than any other flagship even at peak performance though along the edge around the power key there is a zone that gets quite hot at times when the phone is under load but it's still within reasonable limits.